We are happy to report that the first week of CSA went really well! Adding two new pickup sites had us being extra careful counting boxes and making sure everything was going to the right place. 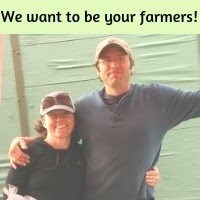 We are starting our sixth year of farming and we are very happy to report that all the amazing things that are supposed to happen when you use organic practices are happening in spades (oh the farm puns!) at the farm. For years we have been building soil health by adding compost, rotating crops, and practicing good soil stewardship by using minimal tillage to create an ideal environment for soil microbiology to do its work, and guys--Ohmygoodness!--it’s really really really working! So, what is it that we do, and how is it that our food tastes so good? (It is really good, right?) It’s certainly the freshness and the care and skill taken with the harvesting and post-harvest handling, along with the flavor, which is directly linked to the soil. Guys, organic is SO MUCH MORE than not spraying poison on food. Organic farming is based on the idea that soil health is directly linked to human health. The practice of growing a living soil that makes vibrant and healthy and delicious food is a career that is deeply rewarding, engaging, and creative. It’s an honor to do this work. Food is meant to sustain, nourish, and be enjoyed, and we love that you are getting to experience food grown in vibrant, healthy, living soil. It’s a privilege and an honor to eat every bite. Partial Shares get all the same veggies in ¾ amounts. Pea Shoots- These are so delicious as a salad green that tastes like sweet peas. They are lovely on your daily/weekly salad as a topping, and also the perfect topping on stir fry. I love to make a big bowl of food, top it with pea shoots and ladle some piping hot broth on top to reduce the shoots just a bit. Baby Romaine/ Baby Butter Lettuce - Guys, simply cut the cores out of these and use the leaves to wrap around all the things! Beet Greens - These may be my very most favorite greens, and the tender young beet greens are always so delicious. Radishes - I love having these chopped up in a bowl in the fridge for a topping for just about anything, but have you ever tried them cooked? Call me crazy, but I made a pizza topped with sauteed radishes and baby kale and it was pretty darn good. Baby Kale- My favorite salad right now is baby kale and chopped roast lamb topped with a creamy dressing. Deliciousness! I love this kale raw, especially enrobed in a creamy dressing and sprinkled with something crunchy like walnuts and/or thinly sliced apple. Thought of the week: Sometimes folks think organic is ‘how food used to be grown’. Much of the history of agriculture hasn’t been sustainable, even long before the advent of petro-chemical farming, land was often ‘farmed to death’. As organic farmers, we are stepping forward into the future by partnering with natural systems and building soil. It’s a practice that is not just sustainable, but regenerative, AND we are doing it in partnership with our local communities...pretty cool stuff.